The issue here was that the phone I was interested in was the Samsung Galaxy S. Which on paper looks great but online has questionable reviews regarding Samsung’s terrible implementation of AndroidOS and a bad reputation regarding supporting their devices after they’ve been sold. Samsung typically has the mentality of “sell it and then we’ll drop support and recommend people buy are new product”… Case in point, with the SGS (Galaxy S) they’ve been promising the latest OS upgrade (v2.2 Froyo) since September yet most of the markets still have NOT gotten the update. I bought the device mostly due to the hacking community. Typically when you buy a mobile or PDA type device you want to make sure that it will be supported. I figured that since Samsung has sold SGS devices in over 120 countries and on every major provider in North America the hacking comunity would pick up for Samsung’s lack of support, with an audience of that many countries/providers I figured that the device would have a pretty big following. For the most part I was right, however I underestimated how important the basic communication and open-sourced-ness of manufacturer->community is. Samsung hasn’t been very forthcoming on their open source code for their implementation of the Android OS, and from what I read a lot of their code isn’t written very well. This doesn’t mean I have buyers remorse, just that I underestimated how important the manufacturer’s involvement is. Nonetheless I had the device for a little while and was curious how difficult it would be use use a hacked ROM on my phone. The device came with 2.1 and I wanted to try 2.2. There were enough interesting addons to 2.2 that I felt compelled to hack the device and see if I could get 2.2 running on it. My first dabbles in this idea were to root the phone, the previous owner had unlocked it so the ‘seal’ had already been broken I figured it was worth trying to root the device. Rooting an Android phone is similar to ‘jailbreaking’ your iPhone/iPod. It opens up the device’s capability beyond what the manufacturer had designed/planned for it to do. This is typically dangerous because often if you’re not careful you can ‘brick’ or permanently damage the device beyond using it. This is made even more dangerous for me because I bought it used without warranty so if I ‘bricked’ my device I would have a difficult type trying to get the original seller to fix it or replace it. Still, being the geek that I am I figured it was worth the try. Now the SGS has some issues, my biggest concern was that I would run into these issues before I even got very far in the hacking process.. that I would hit the issues and get confused if it was my hacking or the issues that caused me to ‘brick‘ my device. I threw caution to the wind and decided to proceed with applying a new ROM that would upgrade my device to 2.2 OS. Everything went well, sometimes I can follow instructions and the device started up with 2.2 and I started reinstalling my software that did not make the initial transition from 2.1 -> 2.2. On a whim though I decided to try using the phone and it worked except I could not accept incoming calls. I figured this wasn’t an issue and felt the ‘hacking community’ would help me out but after 12 hours of reading, researching, questioning and debating I found that there was no way I could fix the device. I was frustrated because everything was working perfectly, GPS connection was fantastic, SMS worked, battery life seemed great, I enjoyed the new 2.2 features around Flash, etc, but without incoming calls the device lost a lot of it’s functionality. I was unsure how to go back to the old 2.1 and I didn’t know how to fix what I had for 2.2. I was disappointed that I had semi-bricked my phone and no idea how to fix it. On a whim I decided to try another ROM and magically it worked. The phone restarted, quickly I retried incoming calls.. WORKED, outgoing calls WORKS, SMS, WORKS, GPS WORKS. The battery life isn’t as good as the last ROM but it’s usable and lets me enjoy the phone for now until a new ROM comes out that has better community support. I learned a lot in the process, not only how a lot on how to hack Android devices but also that persistence pays off. 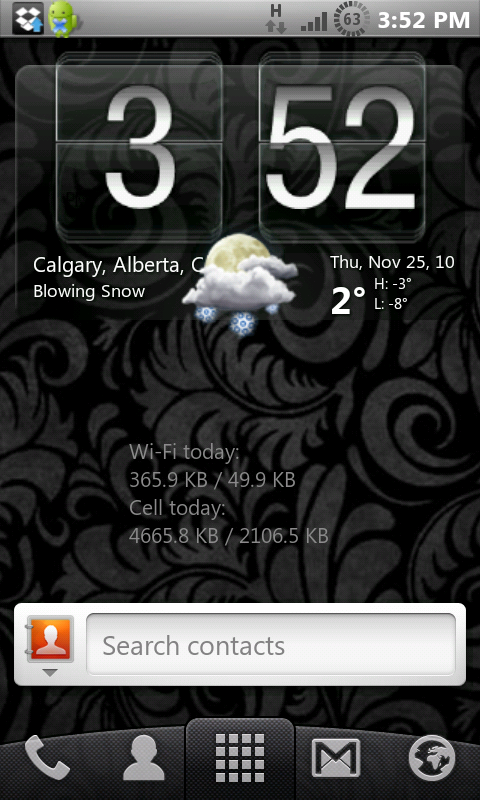 What my current ROM looks like. When working on my own applications at home I realize how much infrastructure code I take for granted from my full time job. For example, my application at home needed to display a table of data. Java tables by themselves are pretty ugly, they work but they look very boring, offer very little in ways of formatting and require you to reinvent the wheel in order to get some nice functionality behind them. I figured “surely there must be some open source tools/code that I can use”. Well I stumbled upon only ONE that actually seems pretty decent. Objectplanet has a decent table but if you dig around you can see that you need to buy a commerical license to get full access to it. And the price for that? A cool $1000. This is a reasonable price really considering the amount of work to write a full-fledged table kit on your own but MAN. We have our own set of table tools in my full-time job that walks circles around Objectplanet’s offering that I never think about when working but in reality it alone would be worth thousands of dollars and it’s such a tiny piece of all the software we use/have developed. The same goes for a wizard framework. Again it was one of the first things I helped write when I moved over from MFC->Java back in 2002 in my full time job. Looking around now there are very few examples/working prototype code that I imagine something I wrote as a requirement at work would likely be worth a lot of money out in the wild. I’m not really sure why I thought about these things when I worked on native code type applications. Perhaps because the controls in Java are so bare-bones that to get something really usable/pretty you have to put a lot of effort into it, whereas for win32/MFC type applications the base controls will do 80% of what you really get done and that last 20% is a luxury that most people won’t miss. Doesn’t really make me want to go back to MFC though. My skills on Windows development now are probably so far behind now I doubt I’d even remember where to begin.